The belief in unidentified flying objects (UFO) is part and parcel of human history. Since ancient times, people described "things" that plowed the heavens. 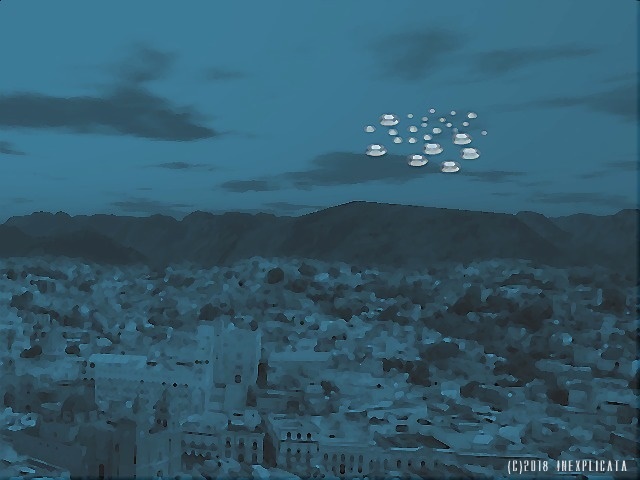 The city of León is no stranger to the presence of these mysterious objects, since sightings have taken place during various times and circumstances. The UFO landing on Mesa de Ibarrilla caused a stir in the public's attention as well as that of the media. There are few who have recorded a UFO sighting more than once. Mexico has researchers who have done their best to disseminate these events, among them Jaime Maussan and Pedro Ferriz Santacruz. Rigoberto Becerra Chávez began looking at the sky in the '80s and has over 20 photographs of unidentified flying objects in his possession. But only 10 of these are compelling, considering that he photographed them with a simple camera. Interviewed by NOTICIAS VESPERTINAS, he recalled that after April 11, 1987 - the date on which a UFO allegedly arrived at Mesa de Ibarrilla - sparked his interest in analyzing the event. "I was very young when I saw a metallic object hanging from the sky for the first time, and then saw it moving. I never knew what it was, and when I saw the lights in Ibarrilla, and seeing the same object years later, I decided I had to know what was going on." At the time he was employed as a security guard at the Palote Reservoir (today the Metropolitan Park). Spurred by the evidence, he purchased a humble photo camera. With his fixed-lens 135mm camera, he took his first photo in 1997 at the entrance to the Metropolitan Park. An oval, silvery object can be seen in the print and on the negative, suspended over a light post at one of the entrances. Two years later, he photographed a similar object in the downtown area using the same camera, then the same a year after, but in the Ciudad Infantil. The same situation repeated in 2003, 2005, 2014 and June 2018. As he took photos, he became part of a group of ufologists engaging in field research at locations with a history of sightings. They investigated caves in various parts of the country, such as the Zone of Silence, Siete Luminarias, Mesa de Ibarrilla and Cerro del Gigante. His photos were published in national magazines specialized in the subject. In the afternoon hours of Thursday, November 8 of this year, he returned to the downtown area and with his camera, took a new photo of an unidentified flying object. The object is above the Municipal Palace, is semi-oval and metallic, casting a shadow, and located almost in the same position as the photo he took in June of this year. Rigoberto, now retired, has devoted part of his life to find a meaning to the objects he photographs, and while refusing to be a person susceptible to this sort of phenomenon, always knows where to point his camera. His work contains two photographic gems - both of them disquieting - taken with his film camera, making it nearly impossible (given the age and technology) to Photoshop, although he is not ready to make them public. "I only take photos. I could say they're UFOs, but people have their own hypotheses. I can only say the images are there and that they're fascinating," he said.